Did Seven call from the SCG? I can only assume Fox are not happy with there ratings and decided to do budget cuts. Since they have been doing this I’ve been watching 7 it lacks atmosphere from the studio. I couldn’t see Fox telling Vossy and Warren Smith to call,a game of NRL from the studio. I heard a cricket podcast a few weeks ago Cricket Unfilted , it was about the fox broadcast and they were saying that they would never want to call a game from the studio again after the Hobart bushfire issue. 1 week later and they live in the studio. Seven were at the ground and Jim Wilson was involved in the post match coverage on the field with Ricky Ponting. I would suggest a ground like Moe probably doesn’t have the capacity to have two commentary boxes and everything required alongside that. Makes sense that if Seven was host broadcasting it, Fox took it all. The space issue may also be a reason for some (not all) of the other games where they’ve taken Seven. Also, it was never really clarified as to how this was going to work and whether Seven has X number of games they were host broadcaster for. I can only assume Fox are not happy with there ratings and decided to do budget cuts. Which has made me look back to when Fox had it exclusive back in the first season of BBL 01 - in which they were having average audience of 380k watching. With the a peak audience of 476k. If we look at the last three weeks the average has been 279k with the last couple only pulling 176k - are Fox thinking they would still be pulling 400k in which they did for BBL 01? As the only games in which have seen those numbers have been ODI (exclusives). Even the exclusive BBL games are a roaring rating feast. **T&C’s - adverts will be played every 3rd over break moving forward. I don’t think the cricket has driven the subscriptions fox wanted. People are not just going to start getting fox because of the cricket. It’s a flawed strategy and they charge too much. People are not just going to start getting fox because of the cricket. Look, we know you hate the deal but it’d be great if you could stop making up stuff like this? I’d imagine there’s a group of people that will want to watch the ODIs and T20Is which they can’t see elsewhere. Look, we know you hate the deal but it’d be great if you could stop making up stuff like this? I’ve seen internal figures that aren’t just disappointing, they’re cataclysmic. AFL and NRL are holding the whole company together but now with Kayo being a cheaper option, you have to wonder just how long Foxtel as a company will hang around for. I got Foxtel back because of the cricket. Most NRL games played in New Zealand are called from a studio (usually by Brenton Speed). True but never happens on Australian soil. look how cramped and small the studio space is. No duck animations during simulcasts where Fox are using their own graphics? Poor. The animated duck stops being funny by the time you turn 10 years old, surely. Heck no. I still get a good laugh from Daddles. Fox Cricket’s Mel Jones and Mark Howard are in Sydney for this morning’s fixture announcement of next year’s ICC T20 World Cup in Australia. It is live on ICC’s Facebook page and tournament website (www.t20worldcup.com) from 10am AEDT. 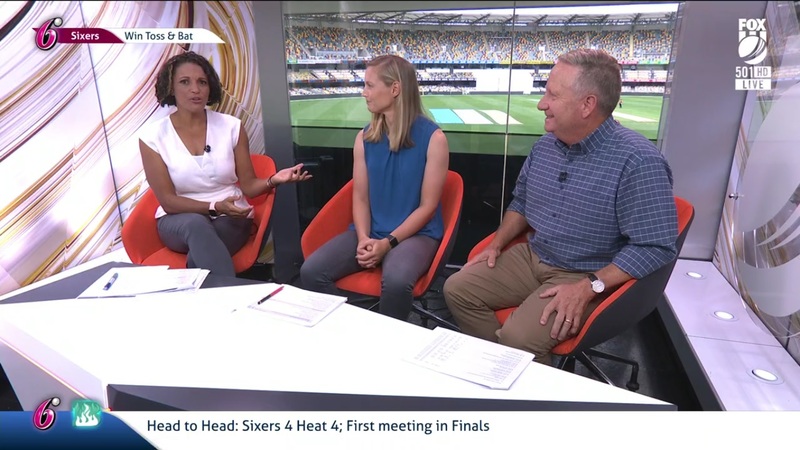 Fox Cricket has the rights to show every match of both men’s and women’s tournament.